Rev. Cyrille S. Fournier, CSV, founder of the Midwest province of the Clerics of St. Viator, died Nov. 13, 1910 at St. Viator College in Bourbonnais. He had been the spiritual director of the students for two years during recent years. He was 67. Fr. Fournier was born on Dec. 30, 1842 in Beaumont, near Quebec, Canada. At the age of 23, he entered the teaching community of St. Viator in Joliette, Canada, making his first profession of vows Aug. 2, 1865 and his perpetual vows on July 27, 1870. On Dec. 20, 1873, he was ordained to the priesthood by Bishop Edgar P. Wadhams of Ogdensburg, NY and was appointed president of the diocesan college of Ogdensburg. He remained in this position until 1878, when he was elected official visitor of the schools of his community in Canada and the United States. Upon his second visit to Chicago in 1882, he organized the institutions of his community in the Midwest into a new province of which he was appointed the first superior. He also opened a novice house in Bourbonnais. In 1888, Fr. Fournier purchased a 15-acre tract of land near Irving Park Road and established the first novitiate in Chicago at the corner of Belmont and Crawford avenues, taking charge at the same time of the newly formed St. Viator Parish in Chicago. 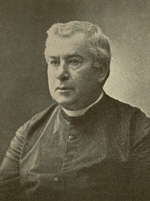 In 1900, he resigned his office as provincial and master of novices to become the pastor of Maternity of the Blessed Mary Church in Bourbonnais. From 1904-1908, he again served as the provincial. Until his final illness, Fr. Fournier filled the office of procurator and of spiritual director at St. Viator College. Fr. Fournier’s funeral took place Nov. 15 at Maternity BVM Church in Bourbonnais. The Rev. J. A. Charlebois, CSV, provincial, celebrated the requiem Mass, with a large number of clergy who assisted in the choir. The entire student body of St. Viator College and large numbers of former parishioners of Fr. Fournier filled the church to capacity. Rev. 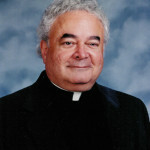 E. L. Rivard, CSV, who was Fr. Fournier’s first novice, preached an eloquent and touching sermon in which he recalled the 47 years which Fr. Fournier had spent in the service of young people. After the Mass, the student body, seminarians, brothers and priests marched in procession to the cemetery where the final blessing was pronounced by the provincial, the Rev. Charlebois.